The beautiful golden state did not disappoint this past weekend as Velocity Sports Performance hosted PRI Integration for Fitness and Movement at their Redondo Beach facility. We had such beautiful weather and a fun group. I wish I could have stayed a few more days! Special thank you to our hosts, Ken Vick and Yo Arakaki for opening up the facility and bringing great minds together to network and learn. 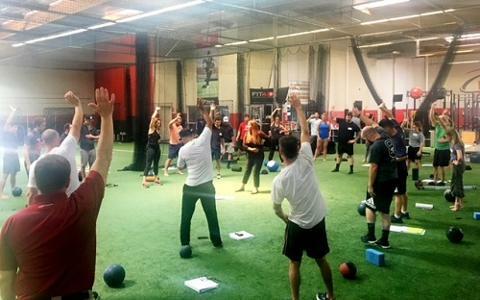 Some of the best personal trainers, strength coaches, and other movement professionals from the area and other surrounding states joined us to advance their understanding of breathing, trunk stability, tri-planar biomechanics, and Postural Restoration. Our first day emphasized respiratory mechanics influence on spine health and posture. We discussed principles of thoracic mobility, diaphragm movement, managing airflow, pressure, and hyperactivity to empower axial frame symmetry to improve alignment and load absorption. Day two dissected frontal plane core organization by actively working the micro movements of the lumbo-pelvic hip complex and integrating those movements with thoracic posture and breathing principles to improve grounding and sensing position. With this we emphasized the perspective of managing spine position via rib handles and pelvic inlets, and discussed closed chain grounding strategies to extend and erect the postural system to vertical. By understanding these micro movements and more intricate relationships, along with the management of internal pressure (i.e. breathing application) we help our clients better organize intrinsic muscles and arrange body segments to improve stability. This organization helps prime movers activate the mechanics to move more efficiently and better oppose external forces and load. I love California and can't wait to return! Thanks again to all those that attended. Thank you also to PRC Matt Varca for all his help with this course and being a great resource to those in California. As I mentioned last course review, we are wrapping up the year and there are only two courses left to sign up: Chicago area and Philadelphia. Visit the Affiliate Course section on the PRI website under Programs and Courses to learn more. You don't want to miss out of this years course! I hope to see you there!